When you’re pregnant, a lot of usually intolerable behaviour can be attributed to raging hormones, and therefore deemed more acceptable in society. These include, but are not limited to, extreme fatigue (resulting in more day-time naps), food aversions (which can make planned meal times difficult), and incredible mood swings (where the woman could go from smiling and cheerful, to irritable and in tears, all within a few minutes). Pregnancy hormones give most of these women a free pass- a sympathetic nod of the head and a whispered aside of comfort- for their behaviour. And why shouldn’t it? Carrying another living being to full term is already a difficult enough task without increased hormone production adding to the mix. This is probably why people are just as forgiving when faced with the fuzziness and confusion of a woman suffering from baby brain. While this is just a vague term used to describe the absent-mindness and general cognitive slips of new mothers and mothers-to-be, it is also a signifier of some very interesting times ahead. If you have never talked to a woman suffering baby brain, you have missed out on a wealth of interesting scenarios, verbal diarrhoea and humorous interactions that have to be seen to be believed. When Andrea Paterson experienced this bizarre phenomenon, and shared one of her moments on Facebook, she soon began to receive other similar comments, inspiring her to release a small gift book dedicated to the theme. This book is filled with awkward behaviours that only the truly absent-minded or baby-brain-fevered can appreciate-from leaving the car keys in the fridge next to the butter, to rocking an empty shopping trolley to sleep. There are stories about women walking around their workplaces half-clothed because they’ve forgotten to zip up their dresses, and others who have accidentally placed their baby monitor in their handbag, rather than their mobile phone. There are some mothers that have twisted words or phrases, much to the confusion of the other people in the conversation, while others have drawn total blanks when asked what their child’s name is. There was even one that wondered why the bath wasn’t full after several minutes, before realising that she had forgotten to put the plug in. My personal favourite is the woman who left her house, realised she hadn’t locked the door, returned home, grabbed something else, left the house again and had to return a third time, where she successfully remembered to close and lock the door! Featuring funny anecdotes and all-too-familiar scenarios for the forgetful, this book would make the perfect gift for a baby shower, or a new mother looking for proof that she is not alone as her sanity slowly frays. 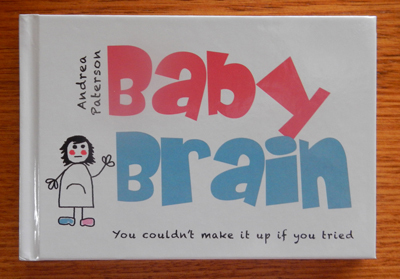 The phrase "baby brain" makes me cringe a bit. I have heard an emloyer laugh at a pregnant woman for making a mistake at work and put it down to "baby brain" when a male colleague made the same mistake and it passed without comment. It came across not so much funny as rude and dismissive. But maybe I'm overly sensitive about that because I've experienced how rude and dismissive people can be about the experience of motherhood in general. Ah well, sounds like a cute little coffee table book.